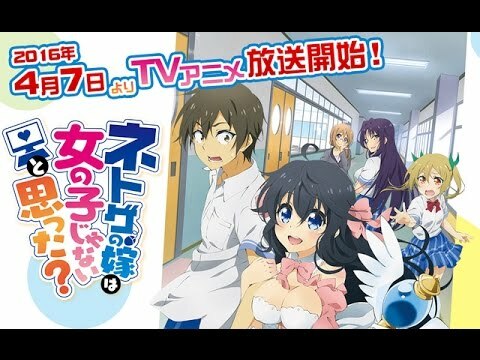 Netoge no Yome wa Onnanoko ja Nai to Omotta or And you thought that girls don’t exist on the internet ? , is both a hilarious title and a decently entertaining show. An adaptation of a Light novel by Studio , Project No.9 a fairly small studio with only a couple of notable projects in the last few years , despite that , they did a good enough job on this slice of life harem comedy. Nishimura or Rusian as he’s known in the, massively multiplayer online role playing game, ( MMORPG ) LA is a naive teenage boy , who spends his days playing online , having been tricked by men online numerous times and even having proposing to a man pretending to be a girl in-game two years ago, he’d decided to never trust any girls online. Until Ako comes along. The story is actually very original actually although it’s in a genre that’s really not. Harem comedies are often extremely predictable and formulaic unfortunately Netoge really doesn’t do much to differentiate itself from its competitors. The humour follows the standard conventions and is largely unambitious , still funny and it’s great to see the writers using all that the MMO setting and culture can give them. If you know MMO’s and gaming you’ll definitely get quite a few laughs. Not to mention I’m sure most people have regrettable experiences with romance in online games. So our MC’s plight isn’t completely unrelatable. The writers definitely know their audience and it was a good change for most of the conflicts be based around problems within the MMO world , rather than relationship drama. Something rather mundane like having your account stolen fills up the entire 24 minutes as a massive epic tale. The soundtrack is pretty forgettable and I’d be lying if I said that I'd be able to recall any of the tracks or even the Opening or ending on the spot. The in-game music sounds just like typical RPG in-game music a ,definite plus in selling the world. The art-style is the very standard , shiny , colourful slice of life style. The scenes within the RPG are probably the most well-animated with fairly complex lighting and shadows. The monsters ( orcs etc ) have a clean cartoonish style that reflects the shows relaxed tone. The combat does a good job of mashing up how intense a MMO can get and rather impressive fight-scenes with the over-the-top comedy style. The characters don’t really have much going for them , both in style and personality. The designs are standard both in reality and the in-game world. Our MC is the typical self-insert harem guy , slightly nervous around girls but over-all likeable. The main expectation is that in this one he actually has a girlfriend instead of just flirting with his entire harem. The girls in the harem are very one-dimensional , the tsundere , the overly-attached one etc. I found them far more entertaining as their MMO counterparts there they felt far more genuine. Which , I suppose , is a half-decent yet I expect unintentional message how people act more like themselves in the virtual world. So , yeah. Netoge no Yome is a very standard harem comedy , I’d put it in the middle of this seasons SOL pile purely because of it’s niche appeal to MMO players.